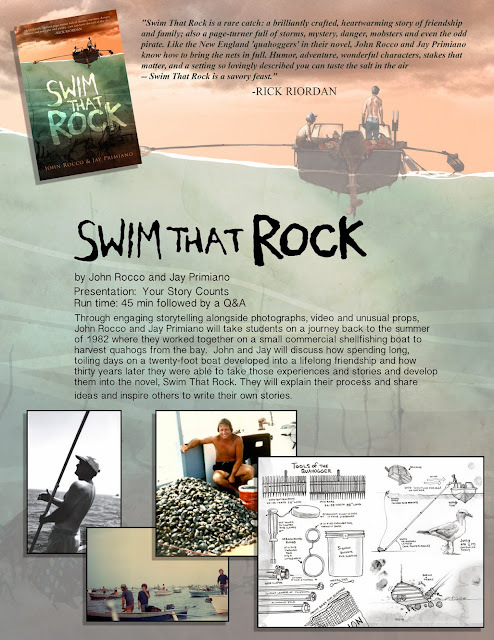 Swim That Rock- School Visits from John Rocco on Vimeo. John Rocco and Jay Primiano will be on tour with Swim That Rock in the spring of 2014 throughout New England. Wednesday April 30th- School visits, Dr. Philip O. Coakley Middle School (Norwood, MA) and Lilla G. Frederick Pilot Middle School (Dorchester, MA. Monday, June 9th- PIZZA PARTY at Buttonwood Books (Cohasset, MA) Public Event. Thursday, June 26th- Jay will be speaking at Weaver Library Summer Reading Kick off event at Weaver Library, 41 Grove Ave, East Providence, RI. 6:30-7:30 pm Public Event. More dates to be added soon. Look for us to come to your New England town! Download the first two chapters on BOOK BUZZ! John Rocco and Jay Primiano copyright 2013 •••. Picture Window theme. Powered by Blogger.